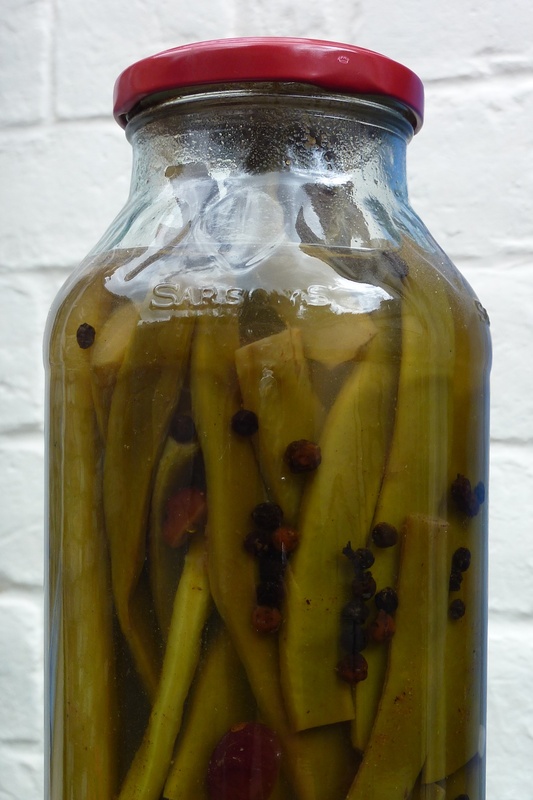 I pickled these runner beans last summer when I was finding the harvest too long and the days too short for constant chutney making. The post got buried in my drafts as I moved on to the next vegetable glut to solve. A year later I can happily confirm that these are definitely worth making if you have runner beans coming out of your ears (they got a universal thumbs up at the plot barbie last week). I used a large pickling vinegar jar to keep my beans whole (ideal for those days when you just fancy something sour to nibble) and adjusted the ingredients according to the weight of beans that fit into my jar. Last summer I could have told you how many beans that was but that handy scribble and the making-of photos disappeared long ago! Trim the ends off the runner beans (no need to string if their young and tender). Cut the beans into lengths about 5mm less than the height of the jar you are using. Meanwhile put all the other ingredients in a pan and stir over a low heat until the sugar dissolves. Then boil for couple of minutes. Drain the beans, add immediately to the spiced vinegar and simmer for 4-5 minutes. Strain the vinegar mixture into a small saucepan. Pack the beans upright into warm, sterilised jars. Return the spiced vinegar to the boil then pour over the tightly packed beans. Cap immediately with vinegar proof lids. Store in a cool, dark place and leave for several weeks to allow the pickle to mature. If you still have runner beans to use up after trying this recipe you might like my runner bean chutney post. This year: At the weekend I made piccalilli for the first time and was inspired by the simplicity and crunch of dry-brining veggies. I’d like to try that process with this recipe when I pickle my runner beans this year because cooking them produced a disappointingly grey-green floppy pickled result. The taste was great though and all the better for having waited so long to try them. Hi Nic, we did’nt grow runner beans this year we had such an overload of them last year! Thank you for the lovely green beans. We had some steamed for dinner then I pickled the rest using your recipe but couldn’t decide which vinegar to use, so I used a small bottle of cider vinegar and balsamic vinegar (cos I love it). How long does it have to mature for? Peggy – I planted fewer this year but have still ended up with a fridge full of beans. Dwarf french beans are much easier and as productive but I do love the look of the tall climbing runners. Bren – glad you enjoyed them and had a successful chutney making session. The vinegar I use is often just a mixture of whatever I have on the shelf at the time. I love balsamic too and will look forward to sampling yours. The runner bean chutney is one of my favourites because it’s fine left to mature but also not to sour to eat straight away. The first batch I made last year was all gone within a month! I made a runner bean chtney last year and still not posted it, lol! This looks great, perfect way to preserve summer for a little longer! kitchen creations are often delayed from sampling to posting I find! Oh wow! River Cottage I hear! I am just waiting for delivery of the latest offering – The Hedgerow! Yes Hugh is a true inspiration to us all don’t you think? This looks like a great recipe and I look forward to trying it when I can a) get my hands on a glut of runner beans and b) a sufficiently large bottle. I already make curried green beans, a traditional pickle from the Western Cape in South Africa and am sure the runned beans would prove equally popular. Roll on summer. that’ll be next year then? These pickled beans have lasted so well I didn’t make any more this year in the end. I’d definitely like to try smaller versions with french beans and love the sound of your curried beans. Do you post your cooking experiments anywhere?